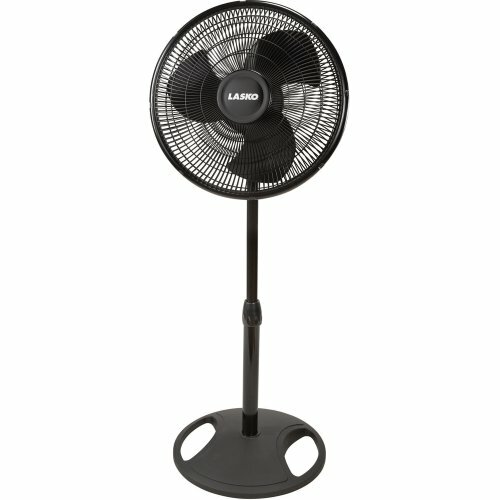 A versatile size for homes and offices, Lasko’s #2521 16-inch oscillating pedestal fan battles stifling summer heat or stuffy enclosed spaces with an arsenal of effective air-cooling features. Perched on a sturdy round base and adjustable-height support pole, the wide-range swiveling head sweeps back and forth across the room and may be tilted back, lifted, or lowered for directed airflow. Three speed settings allow for a gentle breeze, steady wind, or maximum heat-busting blast with the turn of the easy-grip rotary control, and the quiet operation won’t get in the way of conversations or sleep. The fan carries a one-year limited warranty.